The Lost Glen vividly portrays a clash of cultures and personalities against a background of a landscape in visible decay. The cultural collision and its effects are explored through Ewan, a young local man recently returned from university in disgrace, and a retired English colonel staying at the village hotel. Both men in a sense are alienated from the community, the younger because of a haunting sense of failure, and the older through an unwillingness to understand the local culture. They have a mutual antipathy. The Colonel's self-imposed cultural isolation leads to aggressive bullying and an openly lascivious attitude towards local young women. His unworthiness as a representative of Anglo-Saxon culture is largely compensated for by his young niece, who behaves with sensitivity and integrity. She is clearly attracted to Ewan whose sense of failure is complex and does not only concern his enforced withdrawal from university and his involvement in an incident at sea that cost his father his life; it concerns the feeling he has of himself as a spiritual exile - a man who had intended to emigrate but who had remained as an outsider in the land that meant so much to him. He is fascinated by the experience of a local piper, whose finding of a lost glen that had a strange beauty and primordial freshness had been translated into a pibroch. The haunting tune acts as a stimulant to Ewan's Hamlet-like musings on the possibility of a rejuvenation of the landscape or a final disappearance of its life and meaning. The antipathy between the two main protagonists leads to a physical struggle between them that brings to an end a novel, layered with meanings, that is more a symbolic drama than a novel of realism. 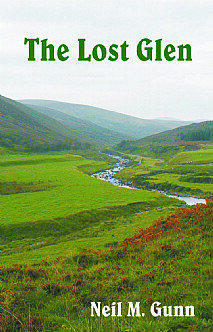 One of the earliest novels to appear in the Scottish Literary Renaissance of the 1920s and 1930s, The Lost Glen turns its back on the form of writing that had depicted Scotland as a rural paradise in favour of describing Highland life as it really was at that time. The Lost Glen is a powerful novel of satire, irony and anguish, that can both disturb and intrigue the thoughtful reader. It will be of immense interest to all who enjoy classic Scottish fiction, good writing, and collectors of the work of Neil M. Gunn.